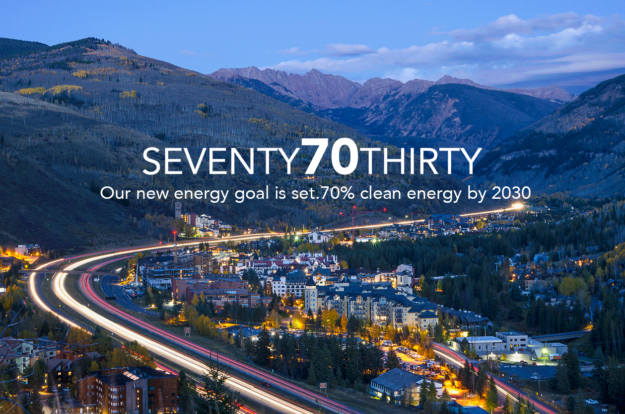 Glenwood Springs, CO, September 19, 2018 — Holy Cross Energy (HCE), the electric cooperative serving the Colorado counties of Eagle, Garfield and Pitkin, including the resort towns of Aspen and Vail, today announced that it has formally adopted SEVENTY70THIRTY; its new clean energy and greenhouse gas reduction goals for its future power supply resources. Accomplish both of these goals with no additional increase in the cost of power supply. To meet its new goals, HCE will increase its purchases of renewable energy while reducing its dependence on coal-fired generation. In addition, HCE will further improve the energy efficiency of its network and the buildings, vehicles, and businesses connected to it. Lastly, HCE will accelerate investments in new renewable energy resources directly connected to HCE’s electric distribution grid and the homes and businesses HCE serves. The new goals – among the most ambitious in the United States – were formally adopted by HCE’s Board of Directors at their meeting today in Glenwood Springs, following a lengthy process of evaluating HCE power supply options and corresponding costs. HCE also reached out to its local communities, surveyed its membership and participated with local stakeholders to develop goals that are aligned with the expressed desires of its members for a cleaner, more sustainable power supply. HCE has long-term power supply commitments through contracts with Public Service Company of Colorado (a subsidiary of Xcel Energy) and the Western Area Power Administration. Additional electric supply comes from several other sources, including biomass, coal-mine waste methane, solar and hydro-power facilities within HCE’s service territory. Founded in 1939, Holy Cross Energy is a non-profit rural electric cooperative that provides safe, reliable, affordable and sustainable energy and services that improve the quality of life for more than 43,000 members and their communities in Western Colorado.